Whether you’re lounging on the couch or you’re cooking in the kitchen, having fruit flies flying around your home is annoying. While they certainly aren’t harmful pests, they aren’t exactly enjoyable to have in your home. If you’re tired of dealing with fruit flies in your home, then today’s blog post is going to be extremely helpful! We are going to touch on some of the ways that you can work on avoiding these pests down the road. One of the main reasons that fruit flies swarm in the home is because of the smells that are attracting them inside of your trash can. If you are someone doesn’t stay on top of taking your trash out, then this could be the leading cause of the fruit flies in your home. The very first thing that we suggest doing to minimize, and hopefully eliminate, the number of flies in your home is to stay on top of taking out the trash. The unfortunate thing about this being a leading cause of fruit flies is that more often than not, it takes a couple of days to fill a trash bag — meaning that the trash sits there for some time. If you’re not filling up your trash bag on a daily basis, then it’s best to invest in a trash can that covers the trash. That way you are not only minimizing the chances of fruit flies, but you’re also able to let the trash sit a little bit longer. As we just finished mentioning, trash is one of the main things that attracts flies in the first place. That being said, it’s essential that you’re acknowledging what’s going into your trash in the first place. Rinsing out bottles takes just a little bit more time to do, but it can help reduce the chances of flies. From spaghetti sauce to milk, having even the slightest bit of food or liquid in a jar can increase the stinky smells of your trash can, create mold, and attract flies. Rinsing them out reduces the chances of all three! The name of these pests gives away one of the many things that attract fruit flies. If you keep fruit out on your counter, make sure that you’re keeping an eye on it so that you know when they’ve gone past their prime. The reason that these flies are called fruit flies is because they are known to be attracted to ripe fruit that’s left out. If you continue to check on the ripeness of your fruit, then you should be able to avoid any flies being attracted to them in the first place. The last tip that we’re going to touch on is another quick and easy thing that you can do to minimize the number of flies in your house. Whether you’re washing off some food before you throw it in a recipe or you’re finishing with dishes, it’s not uncommon for there to be some leftover food or crumbs in your sink. Though they may seem like small pieces of food that you can get away with leaving, it’s these little pieces of food that can also appeal to fruit flies. When you’re done in the kitchen or at the end of the day, spend some time rinsing out your kitchen sink so that all of the food residue and crumbs are washed down the drain. Once you’ve done that, run some hot water and turn on your garbage disposal. This will leave your kitchen sink nice and clean at the end of the day and make it so that there’s absolutely nothing that a fruit fly would be attracted to. If you’re struggling to find the source of your fruit fly problem, it’s time to call the professionals. 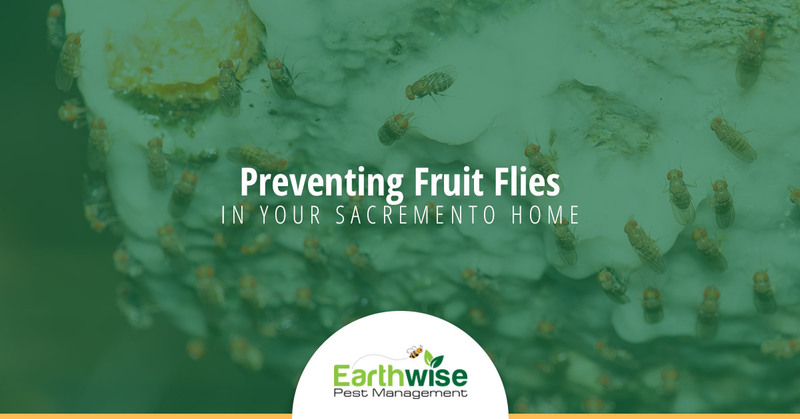 Earthwise Pest Management has provided high-quality home pest control services to the Sacramento area for years now. Through our integrated pest management method, we responsibly remove pests from the infested space by looking at the root of the problem: what attracted them there in the first place. If you’re interested in learning more about our team and the services that we offer, or you’re ready to book your pest control services, contact our team today. We’d be more than happy to help you with determining how to move forward.